Among the many viable avenues for reaching out to consumers, modern technology has given us the convenience of email communication. If used effectively, email marketing can be a productive form of interaction between companies and their customers—both current and prospective. You already understand the importance of collecting consumer emails at every possible opportunity (including in-store and through your website), but the next step is figuring out how to optimize those consumer emails as valuable lines of communication. One of the challenges of email marketing is striking a balance between bombarding consumers with unnecessary messages that they will deem “junk mail” and providing informative, high-value email content. To help you understand the difference between unwelcome inbox toxins and timely, consumer-friendly email content, here are six email types that marketers should be sending. Use email to encourage your customers to connect with your brand through social media. There’s little point to putting effort into a social media account unless you’re actually connecting with fans. If you’re maintaining an active Facebook page or Twitter account, spread the news to your consumers or first-time customers with a simple email notification. Plus, emailing members of your LinkedIn Group allows you to directly communicate with users who share an interest in your industry. It’s best to keep this type of email short and sweet with a descriptive subject line so that your audience gets the message without feeling like they’re being spammed. Reaching out to your consumers without ending up in their junk mail folders is easier if your emails are perceived to offer monetary value. Not only do customer rewards such as birthday bonuses make recipients feel appreciated, they position your brand as a personable organization that cares more about than just the bottom line. Customer loyalty emails do not solicit sales or ask anything of the consumer; rather, they demonstrate gratitude and foster a sense of brand loyalty. Most people appreciate the opportunity to redeem a discount. Customer loyalty emails can help strengthen and build relationships between your audience and your brand. Rather than spamming your entire customer email list with a generic message that may only apply to a certain percentage of readers, consider sending dedicated emails that target a particular group of customers and focus on one specific topic.  For instance, sending a special discount code exclusively to customers with a recent history of online shopping creates more value and than if they’d received a generic coupon. If you have previous customers who have not made purchases recently, you can send out dedicated emails addressing their lack of patronage and offering an incentive to make a new purchase. You could also send out welcoming email for first-time consumers or members. Whatever consumers you target, dedicated emails should raise brand awareness, be easy-to-read, and include clear call to actions. Another great way to utilize email marketing effectively is to send out invitations for upcoming events. Whether it’s an upcoming webinar, an exclusive sale that requires preregistration, or an educational conference hosted by your company, be sure to highlight the perks of registering for your event. Make the email easy to scan by making the importance information and the call to action prominently visible. Including images not only makes your email content look more appealing, it can make it simpler for readers to pick out details. Aim to peak the reader’s interest and keep the copy brief while conveying the benefits of attending your event. Designed to improve your conversion rate by educating potential customers about products or services, lead-nurturing emails should be concise yet packed with information. Use lead-nurturing email content to—as the name suggests—nurture a relationship between your audience and your brand in order to solidify their affinity for you company while expediting the sales cycle. Another benefit is that you can set up messages in advance to be sent any time you receive a new prospect’s email address. These emails should always include a call to action and link to your website, but are most effective if sent shortly after an email address is collected so that your brand remains top-of-mind for prospective customers. One of the most popular types of email marketing campaigns, electronic newsletters allow you to keep consumers updated about your company and products as well as establish a deeper connection with existing customers. Quality newsletters do require a bit of energy and time to create, but the payoff is well worth the effort. You don’t need to include any long format content in an email newsletter, which is more suited to short, engaging, actionable pieces that combine images and copy. Conclude your newsletter with a call to action and write the content with specific intentions, whether your goal is to boost online sales, encourage social media engagement, or increase brand awareness. Get your email marketing in shape. Download our free eBook, "The Complete Guide To Email Marketing." Emily is a freelance writer based in Toronto, Ontario who covers a range of topics from technology to travel. She holds a Bachelor in English Literature and Business from the University of Waterloo. No matter how many projects she is working on, Emily always finds time for baking, reading, and yoga. An infographic look at the rise of marketing automation software like HubSpot, Marketo, Eloqua and more. Learn how to better leverage MailChimp to meet your marketing goals. 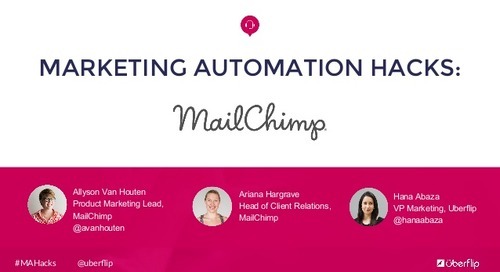 How to make the most of your email marketing with MailChimp. 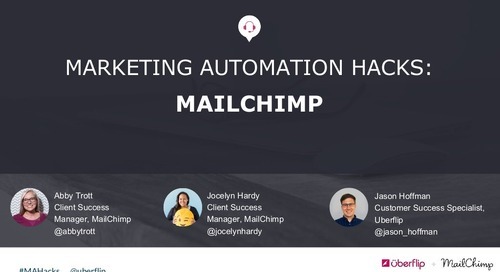 Learn how to better leverage MailChimp in our MailChimp Hacks webinar. A guide to syncing your CTAs with MailChimp to streamline your email marketing and turn more visitors into leads. Marketing automation adoption has increased by 11 times since 2011. 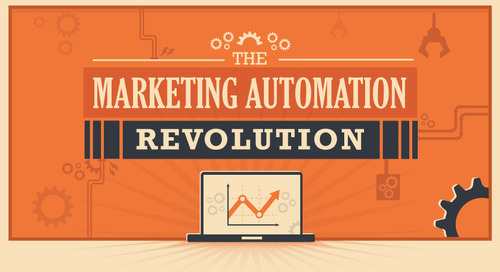 Learn more about the marketing automation revolution. 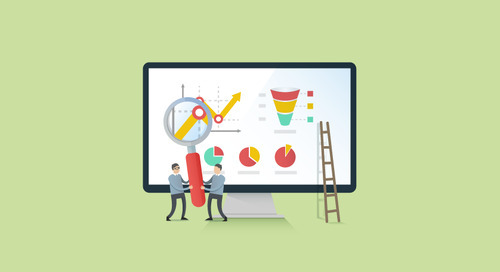 Cleaning up your marketing automation database can help enhance your lead quality and improve the performance of your campaigns. Get to know Zapier, the app that bridges the gap between your marketing tools. 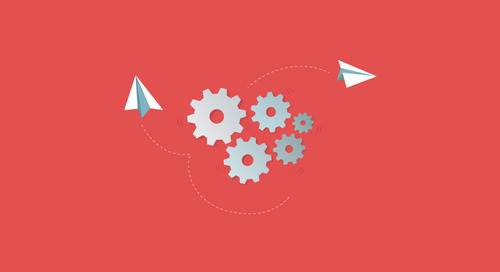 It's hard to maximize Marketing Automation features. And, while we are right there with you, it's in the lesser used, more sophisticated features that all the magic happens. 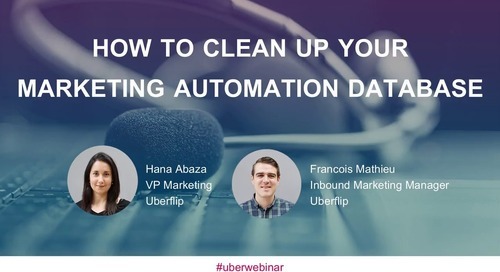 In this webinar, learn how to ensure higher data quality by cleaning up your marketing automation database. Marketing automation can have a tremendous impact on the bottom line of your business but it’s no silver bullet. We look at what to measure and how to calculate the ROI. 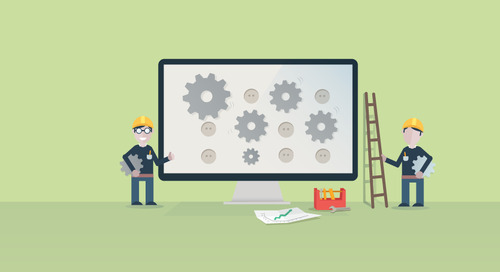 What you'll need to do to optimize your content for your marketing automation. A guide to writing emails that get opened, read, and clicked. Whoever said email marketing was dead hasn't looked at the facts. Are you guilty of these email marketing mistakes? Here's how to fix them.